Weather conditions are important when you visit a new track. Warm, pleasant weather helps to foster positive feelings but those weren't the conditions experienced when we visited the new Barrow-in-Furness track which opened in 2016 at Furness Academy. The Mid Lancs visit there on Saturday was only the 5th meeting held there and its a vast improvement on the old Park-Vale athletics track on Walney Island which has been in a state of disrepair for many years and suitable only for training. The new track is well situated although fairly exposed on the playing fields of Furness Academy. This is a n nice facility that must give Barrow athletics a real boost. On Saturday, however, the weather forecast was dire; unfortunate after several weeks of warm, sunny weather. It started off dry but windy and it wasn't long before the heavy showers arrived. 'Sunshine and showers' doesn't really paint the right picture where torrential rain caused the track events to be suspended for a time and many athletes, parents and officials glad to get back to their cars to warm up and to dry out. The other feature that will have struck those of us at Barrow was the scarcity of athletes. I don't think I have ever attended such a poorly attended athletics match! 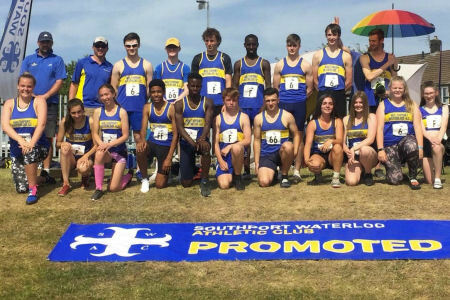 A number of factors will have contributed to this: the weather, the travel distance to Barrow, the start of the school holidays, the League outcomes more or less already decided and most athletes already qualified for the Medal Meeting. Southport Waterloo had just 10 competing athletes so today's result won't have changed our position in the League. Our females will finish 5th in Division 1; our males 6th and relegated to Division 2 by a season of good numbers by Kirkby Milers. 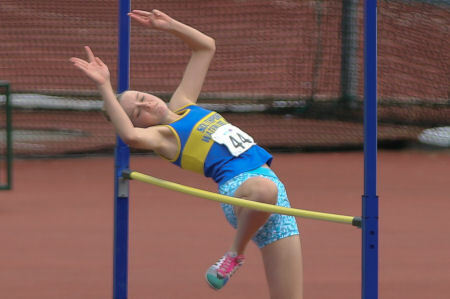 It was not a day for PBs - but Abigael Bamber managed one - and the best performance was Sam Coupland's grade 1 high jump of 1m 70, even if that was 8 cms off his best this year. Despite the weather, athletes should be aware that a new synthetic track is not a fast track. The biggest effect on our numbers was the absence of any of our Under 13 Girls. We did have three Under 13 Boys, two coming along to run 800m - which they managed to do before the heavy rain showers hit. Sammy Pickerill won the race in 2:32.8 and Monty Barr was 3rd in 2:42.6. Jack Bamber featured in the javelin where a 'safe' third throw of 24m 13 gave him 2nd place. 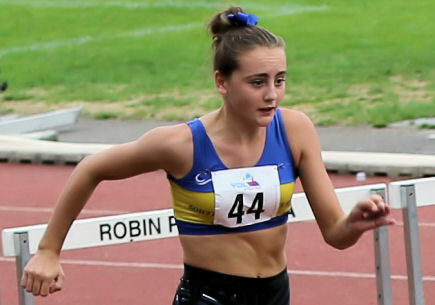 Under 15 Girl Abigael Bamber competed in both sprints, winning the 100m in 13.1, equalling a PB from last year's Mid Lancs Medal Meeting and her fastest time this year, and the 200m in 26.9. On this track and in those conditions these were very good performances! Under 15 Boy Sam Coupland high jumped 1m 70 for 2nd place (on count of failures) and he was 2nd again in the javelin with a best of 30m 98. Preparation for the Combined Events champs looks to be on track. Our Under 17 Women were Megan Howarth and Eve McMahon. Both competed in the javelin, Megan throwing a best of 30m 07 and Eve 24m 90. Katy Coupland competed in the discus and hammer. The discus win of 27m 35 was her 3rd Mid lancs win this season. In the hammer, she was 2nd today with 17m 91. In the Senior Men's events, Graham Boreham ran a 56.9 400m and Liam Harris won the hammer with 40m 89. Thanks to team manager Lee Coupland and to our dedicated team of officials today; Dave Whitehead, Steve Boreham, Liam Harris, Lee Coupland, Ann Dignan, Carole Bamber and Emma Howarth. With a shortage of athletes it was perhaps not a surprise that the meeting was short of officials and many of our officials agreed to help out on other field events. The Mid Lancs Medal Meeting is on Saturday 25th August. Jump to Mid Lancs web site for an Entry form. Entries and payment can be passed to Ron Scott. Although any member can compete at the Mid Lancs Medal Meeting, you need to have competed at two League fixtures to qualify for a medal. 27 Southport Waterloo athletes have so qualified. There are a number of Open T&F meetings coming up as the end of the season approaches. On Wednesday next, Merseyside County have an evening Open Meeting at Wavertree. Warrington has one on Sunday 19th August, Trafford have an open meeting on Bank Holiday Monday 27th August, our own open meeting at Litherland is on Saturday 1st September, Liverpool have a jumps & throws open on Saturday 8th September, the Blackpool open is on Sunday 9th September and Wigan have one on Sunday 16th September. Links to entry forms are on the Fixtures page. There are plenty of opportunities for late season PBs! On a beautiful warm summer evening 11 SWAC runners made the short journey to the popular Harrock Hill race for the sixth leg of the club Fell Running Grand Prix, joining a large field of 203 runners. The race started with a stiff climb up to the top of the quarry and due to the large numbers a bottleneck formed near the top of the climb where the track narrows before opening out at the top to allow the runners to get back into their running. However, it was not long before the next queue formed to climb a style at the end of another narrow section before getting into the open fields. The conditions in the fields were dry and hard making for some good fast running. The race continued downhill crossing a number of fields before reaching the road and starting the climb up Miry Lane to start the climbs back through the fields to the High Moor and then the final climb before a short fast descent back to the road and the final uphill road stretch to the finish and the welcome water. 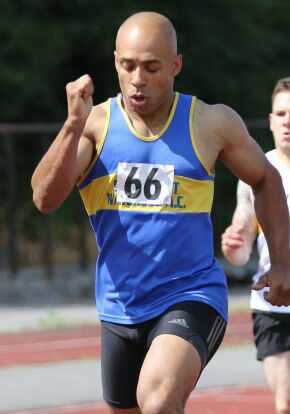 John Sprackland continued his return to form being the first man home for SWAC in 41.45 and gaining another 10 points. Second home was Andy Hudson in 42.56 with Brian Davey (1st V60) in third place in 43.55 followed closely by Gary Kenny in 44.25, next home was Clive James in 48.31 and Billy Hargreaves in 53.20. For the ladies Tracy Allan had a strong run to finish first SWAC lady in 43.22, second home was Michelle Spencer (1st LV40) with Vicki Hudson finishing 3rd SWAC lady in 52.25. Sue Stewart (1st LV70) was fourth home for SWAC in 55.22 followed by Carole James in 57.21. The next leg of the Fell Grand Prix is the Pilgrims Cross raceon Wednesday 8th August at 7.15pm. Congratulations to Graham Boreham and his outstanding team of Young Athletes. Four wins out of four this season and they are promoted as divisional champions. In fact, Graham has led the team since late 2016 and this was his eighth consecutive match win. He took them out of Division 3 last year - such a difficult division to break out from - and, despite the pressures of competing in the higher Division 2 this year, the team has won every round and emerge at the end of the season as Divisional Champions again. Very well done to everyone who has contributed to this team effort. The final scores at the last of the four matches at the Robin Park Arena in Wigan on Saturday were Bury 315, Leigh 334, Warrington 340, Wigan 497.5, Macclesfield 499, Team North Cumbria 530 and Southport Waterloo 605.5. So Southport Waterloo and TNC are promoted to Division 1 and next year will be competing against Crewe & Nantwich, Isle of Man, Trafford and possibly City of Sheffield, subject to any rejigging of divisions. That will be more challenging but Southport Waterloo was, for many years, in the Northern Premier Division of the McDonald's Young Athletes League. So we should approach next season with relish and justifiable optimism. 34 of our young athletes took part in the Wigan fixture, fairly evenly spread over the age groups and about half a dozen more than at the Carlisle fixture. They knew that we were guaranteed promotion but a win would secure the title of Divisional Champions. Their excellent and supportive team spirit was again in evidence with athletes prepared to take on new events to maximise points. 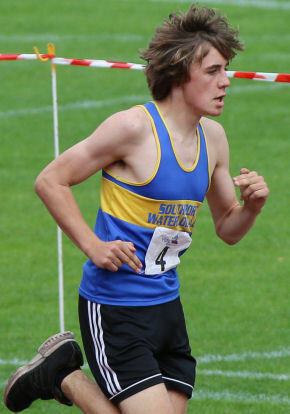 For the last few years, it has been our girl athletes that have stood out in terms of performance but my Athlete of the Match at Wigan was Joseph Kane, returning from English Schools to win both the Under 15 Boy's' 100m and 200m races in grade 1 times of 11.6 and 23.7. The other outstanding athlete was also at English Schools. Sam Coupland won the high jump with 1m 78, well inside the grade 1 standard of 1m 72; and it was a new Club Record. And both these boys were involved with Tom Murphy and Ethan Stanworth in a second Club Record. The same foursome broke the Under 15 Boys' 4 x 100m relay record at Litherland earlier this year and took another half second off it here at Wigan, getting the baton round in 47.6. That time will be hard to beat! And a word about two new members: Abigail and Jack Bamber. In their first competition in club colours, Abigail won the 200m and was 2nd in the hurdles. And brother Jack won the javelin competition - with a new Club Record throw! . Great stuff! Libby had a decent run in the 800m finishing in 2:45.3 and Emily took on the other long race, running 4:35 for 1200m. And Apphia also competed in the 1200m for the first time finishing in 4:50.7. And she threw the javelin 14m 69. Jessica, Grace, Lauren and Libby were 2nd in the relay, getting the baton safely round in 58.2. Our Under 13 Boys were Jack Bamber, Monty Barr, Adam Byrne, Marcus Burgess, Jack Clark, Will Collins, Rhys Hulse and Sammy Pickerill. Rhys and Jack B were both event winners. Rhys won the long jump with a best of 4m 66 and he equalled his PB in the 200m running 26.5 for 2nd place. Jack B, in his first competition for the club, won the javelin competition with a PB throw of 29m 10, which not only puts him at the top of the club rankings this year but 29m 10 replaces Sam Coupland 28m 47 Club Record set in 2016!. 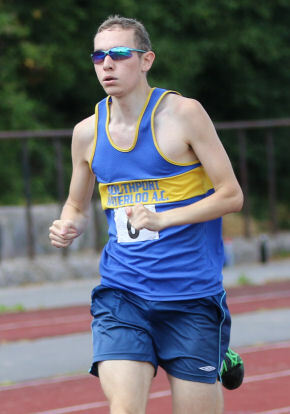 Jack Clark a PB 13.3 for 2nd place in the 100m and he won the 'B' 800m in 2:41: an unusual combination of events and it will be interesting to see which way he develops. Jack also won the 'B' javelin with a throw of 25m 95. Sammy achieved two PBs; 29.3 for 200m and 5:00.9 for 1500m. He also long jumped 3m 83. Will's high jump of 1m 10 was a PB and he ran 5:40 for 1500m. Adam put the shot 6m 23, ran 16.4 for 75m hurdles and high jumped 1m 20. Marcus put the shot 6m 14, and ran 16.0 for the hurdles. And Monty ran the 800m in 2:37.3. Monty, Will, Adam and Jack C ran the 4 x 100m in 59.9. 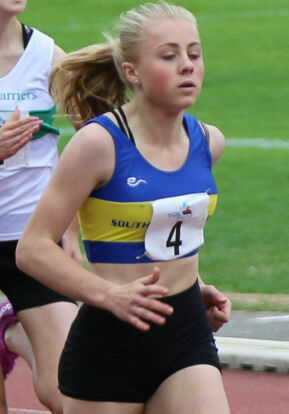 The Under 15 Girls were Abigail Bamber, Alice Bird, Holly Bradshaw, Eleanor James, Annabel Lockie, Lucy Milling, Katie Piercy, Niamh Procter and Hannah Williams, There was excellent coverage of events here and one event win - by Abigail in the 200m, running a PB 26.6. Abigail was also 2nd in the hurdles running 12.4 and she put the shot 7m 04. Katie took 2nd place in the javelin with a best throw of 24m 85 and she ran 13.2 for the 75m hurdles. Niamh ran a first 100m in competition finishing in 14.4. In more familiar territory, she long jumped 4m 28 and high jumped 1m 35 to equal her previous best. Alice ran a 200m in 33.8 along with a 2:51 800m and her javelin throw of 20m 09 was a new PB. Eleanor and Holly both achieved 300m PBs, Holly running 47.3 and Eleanor 49.4. Both girls also ran 800m, Eleanor in the 'B' race in 2:36 and Holly in the non-scoring race in 2:47. Holly also threw the discus 10m 53 and Eleanor the hammer - a PB5m 48.. Lucy was up with the leaders for half of her 1500m race before finishing 3rd in a Season's Best time of 5:25.5. Annabel also ran in the 1500m and her time of 6:00.5 was a new PB. Annabel was also active in the Field, throwing the hammer and the discus. Finally, Hannah ran a 100m in 14,7, a new PB, long jumped 3m 45, another PB, and, competing in the event for the first time, put the shot 5m 97. Our Under 15 Boys were Leo Christian, Sam Coupland, Joseph Kane, Tom Murphy, Jonathon Pilkington, Josh Stammers, Ethan Stanworth and Joe Sutton. This was by far the most successful age group[p with 8 event wins and 5 'B' wins. Very impressive, particularly the club's young sprinters. Joseph K won both the 100m and the 200m in 11.6 and 23.7. Tom won the 80m hurdles in 13.5 as well as throwing the javelin 20m 53 and the hammer 10m 95, a 'B' win. Sam won the pole vault with 2m 80 - well there wasn't much competition - but his high jump was very impressive indeed, clearing 1m 78 to win with a new club record. Sam also long jumped 5m 12. Leo won the hammer competition with a best of 31m 14 as well as running a 2:25 800m and putting the shot 7m 23. The other event wins came in the relays. Tom, Josh, Ethan and Joseph K got the baton round in a great new club record time of 47.5. And Jonathon, Joseph K, Leo and Sam won the 4 x 300m in 2:51. Ethan won the 'B' 100m in a PB time of 12.1 and won the 'B'300m in 40.6. Josh won the 'B' 200m in 24.8 and his 39.7 for 300m equalled his previous best. He also long jumped 4m 80. Jonathon won the 'B' hurdles race in 16.9 high jumped a PB 1m 30 and threw the discus 11m 97. And Joseph Sutton threw the discus 14m 16 , and put the shot a PB 5m 12 before suffering an injury in the 1500m and forced to retire. Thanks to Team Manager Graham Boreham and his team for providing such great athletics all season. Thanks, too, to today's officials Dave Whitehead, Steve James, Steve Boreham, Chris Henders, Lee Coupland, Victoria Dean, Dan Stammers and Carole Bamber. Over the weekend, two of our athletes were competing in separate combined events meetings. 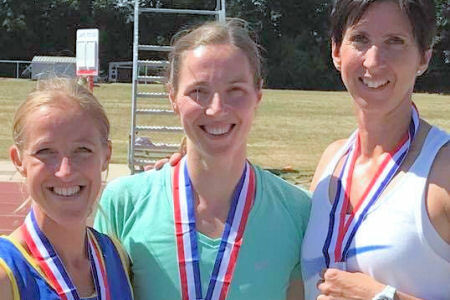 Milly Smith travelled to Woodburn Road in Sheffield for the British Masters Combined Events Championships, where she competed in her age group in the 2 day, seven event heptathlon. Milly has already proven that she is very capable in many different athletic disciplines much to the benefit of the senior athletic team. Day one started with 80m hurdles, completed in 14.70s, followed by a 1.37m leap in the high Jump for a new PB. A 7.00m Shot put and a 29.9s 200m concluded the first day with a total of 2194pts and amazingly 2nd place. Day two started with a personal best equalling long jump of 3.89m, followed by new best of 22.13m in the javelin. Milly was not looking forward to the 800m at all, but completed this in 3:19.1 retaining her second place throughout the day and being awarded with a British Masters silver medal and a place on our Roll of Honour page. Excellent work Milly. Masters athletics is there specifically to allow for seniors to compete in their own ‘veteran ’ age groups. If you are interested in joining Southport Waterloo as a veteran please contact any of the coaches who will introduce you to our growing team. 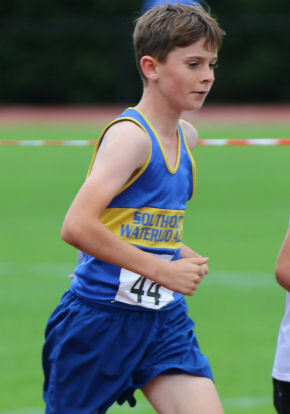 Meanwhile, junior athlete Sam Coupland, fresh from his outing to English Schools travelled to Much Wenlock to take part in the Much Wenlock Olympian Games to tackle the one day, 5 event pentathlon joined by Joshua Stammers also attending to sprint and long jump. Much Wenlock is home to the Wenlock Olympian Games. These famous games and Dr. William Penny Brookes, the founder, are thought to have inspired the modern Olympic Games that began in 1896, only 6 years after BaronPierre de Coubertin (the founder of the International Olympic Committee) visited the Games. In the 2012 London Olympics, the mascot for the games was called “Wenlock” in honour of this link. Joshua, ran 100m in 12.3s for a silver medal, ran a heat of the 200m in 26.0s to qualify for final where he ran 25.6s for another silver. His best performance was in the long jump where he increased his PB to 5.50m adding 22cm to his precious best measure for a further silver medal. Sam’s day started with a new PB of 12.5s in the 80m hurdles, followed by 9.04m in the shot. Another PB in the Long Jump of 5.57m was a massive 1cm increase on his previous best. Sam’s regained High Jump form had him leap 1.74m and this was a new games best performance, finishing with 2:22.7 in the 800m for a total of 2,573pts, winning the gold medal with a new games best performance and an increase to the club record by another 30pts. Interestingly, some 15/20 years ago, Southport Waterloo (Jack Salt) used to run an annual club trip to Much Wenlock for these games. Something we shall have to consider re-establishing as it was a positive experience. 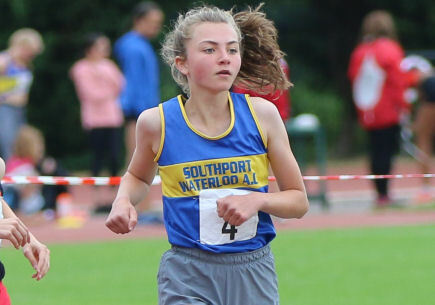 The 88th New Balance ESAA English Schools Championships were held on Friday/Saturday and Southport Waterloo had 5 athletes taking part. Senior Boy Harry Flanagan, Junior Boys Joe Kane and Sam Coupland and Junior Girl Olivia Logan representing Merseyside Schools whilst new club member Lauren Lewis represented Lancashire Schools as an Intermediate Girl. Athletes travelled as a team to their respective hotels on Thursday, ate as a squad before team meetings and an early night as some were competing in the morning session on Friday. Friday morning was warm and sunny and the Championships started at 10:00. It wasn’t long before Southport Waterloo had its first representative in event number 3 at 10:34. In action was Olivia Logan in heat 2 of the Junior Girls 1,500m. In a very strong field, Beatrice Wood from Wiltshire won and would go on the next day to win the final. Olivia ran a strong race. Though she did get boxed in a little she finished very strongly, crossing the line in 4:51.59 for 12th place. In a very busy morning session where the starters' pistols seemed to be firing constantly with sprints in the home straight and hurdles in the back straight, Lauren Lewis was our next athlete on the start line in the Intermediate Girls' 100m. Lauren ran 12.81s in heat 3 and though she may be disappointed missing out on a semi-final place. she did set a PB of 12.3s set earlier this season. We look forward to seeing Lauren in her Southport Waterloo vest soon. Shortly after, Joe Kane was walked to the start line by volunteers from local schools, after spending some time in the call up area, such is the professional structure of this very well managed event. Joe was in the Junior Boys 100m heat 2, ran 11.95s finishing 6th behind heat winner and eventual gold medallist Graig Anya Joseph from Essex. Harry Flanagan squeezed himself into some very small Merseyside purple shorts for his heat on the Senior Boys' 200m. He finished 5th in 22.55s but this was fast enough to qualify for the semi-finals on Saturday as a fastest loser. 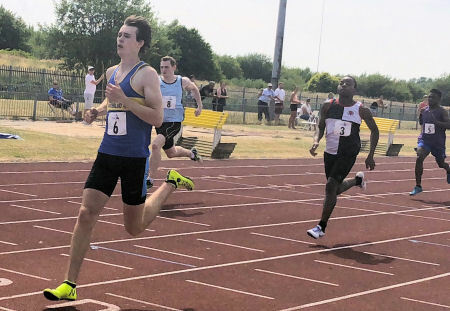 The last track action for the Southport Waterloo athletes saw Sam Coupland and Joe Kane in legs 1 and 2 of the Junior boys' 4x100m. In heat 1 the Boys' team came home 3rd in 46.06s qualifying for Saturday's final as a fastest loser. After a team meeting the squad had some time to relax, and it is here that we really understand just how “rock & roll” our athletes are… Sam and Joe, who were ‘rooming’ together, spent a couple of hours laying on their beds sharing grapes whilst watching “Love Island”. We’re not sure if the Lancashire hotel was such a riot? The crowds were even bigger on Saturday, and had already built up by the time the Merseyside coach arrived on two wheels parking with a handbrake turn, the team walking into the venue past security as they all had their athletes accreditation lanyards; a well drilled outfit. It was warmer too with the sun ever present. Harry Flanagan’s shorts seemed even tighter as he made his way to his 200m semi-final, running a superb 22.55s. Harry was disappointed not to make the final, but he has been amazing this season. A real example to the junior athletes. Harry’s last action at English Schools was to run in the Senior Boys 4x100m, but with 2 high jumpers on the team the race was lost by the time Harry received the baton. They finished in 43.73s; still fast but missing out on a fastest loser spot in the final by 0.24s. 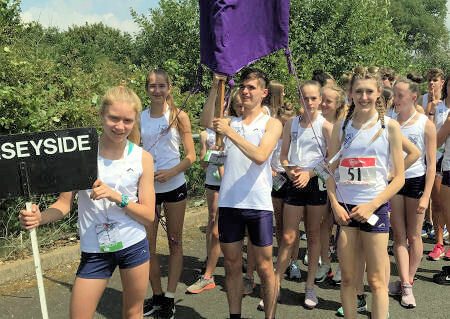 Olivia Logan was selected to carry the Merseyside sign in the athletes parade, showing signs of her speed from the previous day having to stop and wait for the squad to catch up as they paraded past. It was 14:45 when Sam Coupland was brought out with the other 26 Junior Boy high jumpers. Sam’s early season best of 1.76m has not been something he’s recently been close to, but he has worked hard with Coach Claire and should be happy with a clearance of 1.72m for 15th place in an event won by David Bazuaye of London with a leap of 1.90m. The final action from our athletes was the final of the Junior Boys' 4x100m, Sam Coupland and Joe Kane, this time legs 1 and 3, helped bring the baton round in 46.14s for 6th place. Ed: Worth noting too that the Merseyside Junior Boys won the Minor Counties trophy and the Senior Boys were 2nd. This was possibly the best performance by a Merseyside Schools' team for many years and reflects the young talent in the county, including Southport Waterloo. A win at Burnley in the 3rd of 4 rounds of the Northern T&F League would have continued the winning form of this year but losing three from the Men's team on the day of the match made it extremely difficult for Team Manager Lee Coupland to plug the gaps in the team sheet. A number of athletes answered their manager's call for more events - Liam Harris in the long jump, Jack O'Neill throwing javelin to name just two - and so we just scraped thru' into 2nd place. The final provisional scores were Seaton 404, Southport Waterloo 345, Kendal 326.5, Burnley 289.5, Border 283 and Pendle 171. Interestingly, our points for officials made the difference between 2nd and 3rd with Kendal losing out for lack of officials. Today's scores, subject to scrutiny, still leave us in 1st place in the division with 17 League points, 2 League points and 30.5 match points ahead of Seaton. Having led all season, the objective must be to gain promotion as Divisional champions. However, the final match is hosted by Seaton at Whitehaven and we can expect them to be strong on their home track. A 2nd place behind Seaton would be enough but we need a strong team to travel to North Cumbria on 4th August. For me, there were several highlights. First of all, as mentioned, the willingness of athletes to take on extra events, so much so that by the end of the relays several were showing signs of exhaustion. In a relatively well filled team sheet, our female squad recorded 13 PBs; a magnificent performance. And, of course the day's competition started well with Liam Harris at last beating the club record in the hammer. He has been so close for some time that it is a relief that it is now achieved. 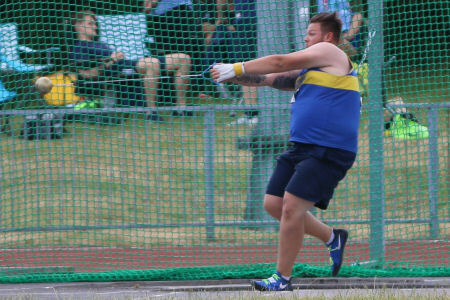 In fact, I understand that he broke the club record with two of his throws, the best being 43m 12 to replace Paul Jenkins record of 41m 64 set back in 1980. With the pressure off, I'm sure Liam will go on to extend that record. Our 10-strong Female team were Amy Bloxsome, Katy Coupland, Megan Howarth, Joanne McDougall, Eve McMahon, Sarah Pickerill, Stephanie Robertson, Milly Smith, Olivia Taylor and Freya Walsh. Stephanie won her three individual events with PBs. She won the 100m in 12.8, the 200m in 27.0 and, in the long jump, clearing 5m 03. Amy was the other sprinter enjoying an incident-free afternoon at Burnley. She ran a PB 14.2 for the 100m and 31.7 for the 200m. Katy was again in action in 6 events, She ran both hurdles, running 113.7 and a PB 28.7, and in the Field she cleared 1m 10 in the high jump, put the shot 7m 33, threw the discus 29m 29 and the hammer 18m 58. Milly also competed in 6 events! On the track she recorded a PB of 75.3 for 400m, a PB 20.2 for 100m hurdles, ran 80.3 for 400m hurdles and in the Field her 1m 35 high jump was also a PB. Milly also ran both relays. 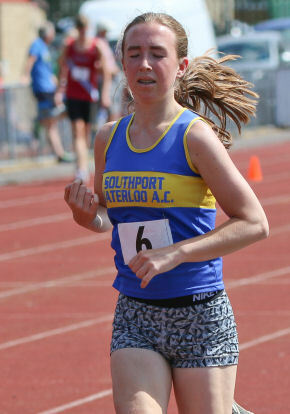 Joanne ran 78.8 for 400m and a 1500m in 7:14.9. I may have mentioned before that, back in 2000/01, Joanne ran 24.5 for 200m and 56.7 for 400m, both club records. Sarah ran 4:08 for 800m , long jumped to a PB 3m 64, and achieved another PB in the discus with a best of 17m 45. Megan was an event winner in the javelin with 29m 19 and her 21m 98 hammer throw for 2nd place was a new PB. Eve won the 'B' javelin with 26m 43 and the 'B' shot with 6m 57. Olivia ran in the 800m clocking 2:49.5, her times nicely reducing with every run. In the 4x400m she took the first leg and was leading at the first change-over.And Freya was 3rd in the 1500m in 5:47 before running the final leg of the 4x400m in the fastest split of 68.9. In the relay, Amy, Milly Joanne and Stephanie got the baton around in 56.0, Stephanie finishing like an express train but not quite able to catch the leader. Olivia, Milly, Joanne and Freya got the baton around in 5:09 for 3rd place. Our 9-strong Male team comprised Lee Coupland, Graham Boreham, Chris Burgess, David Gough, David Hamilton, Liam Harris, Drumayne Moore, Jack O'Neill and Luke Suarez. Liam's hammer throw of 43m 12 was the best performance of the day and the men's only event win. Liam went on to throw the discus 25m 32, put the shot 9m 76 and he willingly did the long jump achieving a best of 2m 96. With Harry Flanagan resting before English Schools, but present at Burnley to support the team, Luke was our 'A' sprinter. He ran 12.1 for 100m, high jumped 1m 50 and long jumped 5m 35. Jack and Chris were the other sprinters. Jack ran 12.2 for 100m and 25.2 for 200m. And for someone who doesn't normally throw javelin, 29m 24 was an excellent achievement. Chris ran 24.9 for 200m and 57.9 for 400m and in the Field he put the shot 7m 70 and got in a good javelin throw of 27m 75. Running both relays might have been an event too far but, with others, he gave everything for the team. Graham ran a very good 800m in a PB time of 2:08.4, but was less pleased with his 55.2 400m run, by which time the headwind in the back straight was proving challenging. Graham ran the fastest leg in the 4x400m relay, leading off with a 54.3 run. 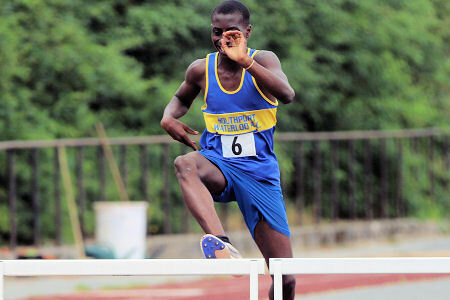 Drumayne ran the 400m hurdles in 73.0, despite an altercation with the 2nd last hurdle! His 1m 60 high jump was a PB and he cleared 9m 85 in the triple jump. David Gough had a busy day earning points for the team. He ran the 3K steeplechase in 13:47, the 1500m in 6:14, the 5K in 23:01 as well as clearing a season's best in the triple jump of 8m 80. David Hamilton is becoming a regular in the 5000m and finished today 3rd in 17:34. Finally, Lee threw the hammer 18m 69 and his discus throw of 19m74 was a PB. Thanks to our team manager Lee Coupland and officials Dave Whitehead, Steve James, Steve Boreham, Lesley Scott, Emma Howarth, Barrie Hughes and Lee Coupland. Thanks to all athletes and please book 4th August for that trip to Whitehaven! We have been notified today that, following a prolonged illness, Brian Grice, a long time servant of the club and of athletics locally passed away last Thursday. When I joined the club in the early '90s there was no web site, no new member booklet to guide new members and it was Brian Grice who took it upon himself to write me a long letter answering all my enquires about the club. His main interest was in road running and he organised several of our road races in the '80s and '90s; and he was also effectively the club's road race statistician. He would regularly lament the falling standard of road running in local races. The historical road running data reproduced on the Road Running page of this web site were provided by Brian. 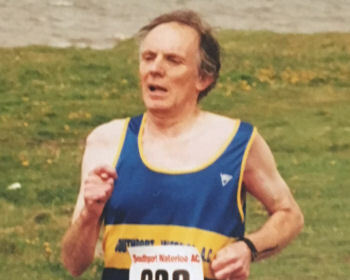 Brian was also a UKA-accredited road race measurer, regularly called upon to validate road race distance in the North West of England, and indeed for club races including the Junior Schools XC Champs courses in recent years. For Brian too, the club was an important part of his life and we know it provided him with many happy memories. A quiet man, Brian's services to Southport Waterloo were greatly appreciated and in 2014 he was awarded the club's Long and Distinguished Service Award. The dry conditions on the fells have resulted in some fast times this summer and for the second Grand Prix race in succession the course record was broken. However, at this race both the men’s and ladies records fell. Josh Boyle finished in 35.42 taking 39 seconds off the men’s record and the Katie Walshaw finished 8th overall in 40.20 taking nearly 5 mins off the existing ladies record. Both runners were from Ribble valley Harriers. For SWAC it was good to have John Sprackland back running on the fells, after his illness following the last cross-country race at Ulverston and I had a good tussle throughout the race with him. After a steady start John gradually caught and passed me on the steepest climb in the middle of the race. After running around the top of Darwen Moor, I was able to catch and pass John on the steep downhill section, after which we were running together, before the superior speed of John on the flat road section eventually enabled him to create a winning gap, which he maintained up the final short climb and run in to finish to record his first victory in this year’s Fell Grand Prix series. John Sprackland was first home for SWAC in 47.38, followed Brian Davey in 48.01(1st V60) with Clive James coming home third in 53.18. Michelle Spencer was the only SWAC lady to run and after having competed in the Saunders Lakeland Mountain Marathon, the previous weekend, had a good run to finish in 55.36. Michelle has now scored the maximum 40 points in the Grand Prix standings. The next race in the series is at Harrock Hill on Wednesday 25th July. The annual Yr 7 Schools Inter Counties match between Merseyside and Cheshire took place at Ellesmere Port on Wednesday evening in the glorious summer conditions we have come to accept as 'normal' this year. I'm not sure if Merseyside has ever won this match - Cheshire is a far bigger county after all! - but it was reasonably close this year with Cheshire scoring 249 to Merseyside's 206.. In the very first event, Amber Hughes destroyed the first hurdle in the 70m hurdles race, didn't finish and had to spend the rest of the evening in hospital E&A with a broken wrist encased in plaster. Her knee didn't escape injury either but young bones heal quickly and we are hopeful of seeing Amber compete again later in the summer. Jessica Keenan did finish the hurdles and was 3rd in 13.2. Grace Malone ran 100m in 14.7, a new PB, and she put the shot 5m 77 for another PB. Jenna Christian competed in the high jump and cleared 1m 25. Sierra Jalloh won the 200m race in 27.2. Interestingly, Merseyside took 1st, 2nd and 3rd in the 200m leaving Cheshire with 4th, 5th and 6th. Sierra was also 2nd in the shot with a best of 7m 23. Elizabeth Wake ran the 800m in 2:44 and she threw the discus 13m 19. In the Boys' team, Rhys Hulse was 4th in the 100m with 13.5 and he won the long jump with a PB best clearance of 4m 73. And Jack Clark was 2nd in the 200m in 28.4 and 3rd in the javelin with a best of 28m 13, a new PB by almost a metre. Photo here courtesy of Barrie Hughes. In previous fixtures in the league the composite team M60 Nomads (made up of teams unsurprisingly from around the Manchester area) had been victorious and Southport Waterloo had come second. As this was a M60 Nomads home fixture, it was expected that they would win again, worthy league champions given the size and ability of their squad. Our strength and depth was challenged by some absentees, but the team was also bolstered by some new faces. The initial team selection included additional events for some willing volunteers just in case the clubs behind us in the league turned up on multiple buses... they didn't and we settled into another successful day, again finishing second. At the conclusion, M60 Nomads were running 4x400m races alone whilst we enjoyed a squad photograph. The final results: M60 Nomads 687pts, Southport Waterloo 547, Border Harriers 288, Bury 188, Blackpool 170.5, St Helens 135.5, Team North Cumbria 129, Horwich 127. With two teams advancing to division 1 we are promoted at the first time of asking the final league results being: M60 Nomads 24pts, Southport Waterloo 21, Border 18, Blackpool 13, Bury 13, Horwich 8, St Helens 7, Team North Cumbria 4. Whilst this season has allowed our team to compete against some very good athletes from other clubs, there has been issues with squad sizes and it is very positive that next season we shall be given more of a challenge. The team manager is very grateful to all the athletes, coaches, officials and parents who have supported this league this year. This years second year U15's should be aware that they are already pencilled in for this team next year. U20 Men Harry Flanagan has been amazing this season to date, sprinting 100m in 11.4s to win, 200m in 22.4s to win and bringing home the 4x100m team to also win with Ben,Jack and Darion. Ben Apps was versatile on the day changing from 200m to 100m to allow for traffic issues within the team, he also arrived asking if he could High Jump... 100m in 11.7s a new PB to win the 'B' race, 1.68m in the High Jump and winning the Triple Jump with 13.12m. Jack O'Neill sprinted 200m in 24.8s a new seasons best and 400m in 57.6s his first time at this distance. Darion Moore, ran 58.0s to win the 'B' 400m then ran the 800m in 2:51.4 to also win that, he Long Jumped 4.56 but gave up trying to convince his follow 4x100m to also run the 4x400m... Away from the track the Byrne brothers have been a real asset to the team, ever present and scoring loads of points. Nathan putted the Shot 11.05m equalling his seasons best, threw Discus 32m winning this event and Javelin 23.46m. Daniel's Shot of 7.72 won him the 'B' points, in what I think was his first effort with this weight, he also won the 'B' Discus with 19.02m, I assume X must stand for excellent in the Javelin results? Rather than 3 no throws. U17 Women Ava Leigh from Burnley has been ever present this season as a second claimant to which we are grateful. On Sunday she represented with U20 weights, 9.59m in the Shot a new PB to win and 34.24m in the Hammer for another victory, we look forward to seeing Ava in her Burnley colours at next weeks Northern League fixture. Amy Rex threw as an u20 in the Javelin, 18.79m and Discus (though this is the same weight as U17) 19.84m for a new PB and U17 in the Shot with a put of 8.82m a new PB and 'B' win. Bekki Roche from Wespa, who trains regularly with the Southport Waterloo throwers is another very welcome second claimant, putted the Shot 13.27m to win, threw the Discus 28.83m to win and the Hammer was launched 48.93m for a hat-trick of victories. Megan Howarth launched her javelin 30.83m and won the 'B' Hammer with a throw of 23.65m. Eve McMahon won the 'B' Discus with a throw of 18.01m a considerable new PB, she also won the 'B' Javelin with a throw of 27.82m after some early no throws maybe caused by "Prom-Nails". Steph Robertson sprinted the 100m in 13.4s, won the 80m hurdles in 12.7s and also won the Long Jump in 4.73m. Lauren Lewis, second claimant from LPS ran the 100m in 13.4s to win the 'B' race. Olivia Taylor who is relatively new to athletics but proving a good team member and developing nicely ran 300m in 48.8s and 800m in 3:01.8. Lilly Ann Grayson ran the 200m in 28.9s and the 800m shortly after in 2:32.8 to win. Freya Walsh was fantastic winning both 1,500m in 5:49.9 and 300m 'B' in 49.3s. The 4x100m time of 55.6s was good for 2nd, the team was Steph, Freya, Eve, Lilly-Ann. U17 Men was a depleted team missing both Luke Suarez and Ethan Harrison. We did bring in Marcus Bathie second claimant from LPS, who ran 100m in 12.4s and 400m Hurdles in 67.1s. Joshua Bankier picked up events he doesn't normally do as well as the 400m, 100m in 14.0s equalling his PB, 400m in 60.8s and Long Jumping 3.62m with a nice safe 3rd jump after two fouls. Drumayne Moore's performance in the recent schools Octathlon is a team managers delight, and he's also currently learning to Pole Vault... he ran 400m in 65.6s, High Jumped 1.55m to win the 'B' points and triple Jumped 10.23m. 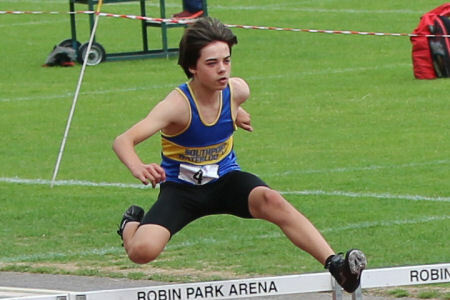 Jamie Hopkins from LPS has supported us throughout this year again we are very grateful, he high Jumped 1.74m to win, Triple Jumped 11.82m a new PB to win and completed his hat-trick by winning the 100m Hurdles in a new PB of 15.5s. Finally, Patrick Manchester has been ever present also this season, 9.70m was a new PB in the Shot, 25.26m another PB in the Discus and 20.83 in the Javelin. No relay for Patrick this week as Marcus, Jamie, Joshua and Drumayne completed the 4x100m in 49.8s for 2nd. At the end of the day, a new banner was unrolled (that might get plenty of use this season) squad photos were taken and aftersun lotion was at the ready. Our regards to the young Blackpool athlete who was so pink he can't have enjoyed a very good sleep that evening. Thanks to Steve Boreham, Emma Howarth, Barrie Hughes, Lol Walsh, Steve James and Dave Whitehead for officiating. Two consecutive weekends of scorching weather and the road runners have been out in force at local grand prix events. Penny Lane saw 18 SWAC runners cross the finish line whilst 23 finished at the Southport Half. The story of both seems to be the same. Meet up for a group photo, run then get together afterwards for a chat about how hot it was. The Penny Lane 10k saw many of our runners getting first or second in their age categories. This race involves a once around the sports field and then 3km into a slight breeze along the River Mersey ending in a U turn which gives chance to cheer on fellow runners as you pass them, before a diversion into Otterspool Park before heading back up to the sports field. I've never ran this on anything but a warm day, but for future reference definitely a PB course for anyone wanting to give it a try. Francois Rafferty (37:11) was first home, then Keith Lunt (39:45) both taking 2nd in respective age categories. David Wright (40:47) and Carl McMahon (40:51) had a neck and neck finish, but chip times separated them a little more and Stephen Ward (40:58) followed them home. Next up was first SWAC lady home Trace Allan (41:22) also taking first lady, with Mike Walker (42:16) taking M65 followed by Graham Liu (47:13), Amanda Bradbury (52:02) and Sue Stewart (53:00) who took F70. Sarah Lunt (53:03), Gina Bellhouse (53:31), Helen Lodge (54:00), Sophie Bennet (54:19) followed then Susan Cooper (55:06) took the F60 prize. Mari Dyson (58:14), Catherine McElhinney (57:46) then Jane Blacklin (58:00) completed the SWAC members. The Southport Half again saw a few of our runners taking awards, as did the 10k which was held at the same time. The half involved a run through Victoria Park, down Lord Street, around Hesketh Park, then up and down the Coast Road before going into Kings Gardens and Princes Park and more of the Coast Road and eventually back to Victoria Park. Keith Lunt (1:28:19) was first home, then Mike Walker (1:32:13) defended his top of the men's GP position and taking the M60 prize. Next up was Boyd Park (1:32:15) and Trace Allan (1:32:38) taking 2nd lady. Alex Waddelove (1:33:11), David Wright (1:35:41), Andrew Cara (1:34:21) and Keith Swift (1:39:51) all followed, along with new member Paul Hill (1:41:56) then James Brooker (1:44:27) and 2nd SWAC lady Nicola Simpson (1:45:14). Tracy Barlow (1:47:34), Jason Oliver (1:52:58), Amanda Bradbury (1:57:23) and Gina Bellhouse (1:57:54) all broke the 2 hour mark, followed by new member, and our new Road Running Secretary, Malcom Teale (2:00:22) who had guided Catherine Fearnley (2:00:21) on her 3rd half marathon. Ian Kilshaw (2:06:03), Rachel Thomas (2:10:05), Jane Blacklin (2:12:31) and Heather Goadsby (2:17:54) followed behind, along with Peter Gale (2:24:51) who had struggled with the heat and required assistance but I am told was quickly recovered. Finally Emma Hopwood (3:01:56) and then Mari Dyson (3:08:11), who was guiding James. We are also adding 2 events to the Grand Prix. First to replace the 'May TBC' which was put back to August, then to next year. The 2nd to compensate for the clash between the rearranged St Helen 10k and the Tunnel 10k. These 2 events will be the Crosby parkrun on 21st July and the English Half Marathon on the 16th September. With such huge turnouts the meeting up for photographs is becoming really popular. Hopefully by the next event we'll even have our own banner flag to meet by! Also, to encourage you to be involved there will be a small medal presented at the Club's Awards Evening to everyone that completes at least 5 events. With 4 more to go, if you already have your name on the Grand Prix then there's chance to complete. One of the aims of the Grand Prix is to encourage many of our runners to attend the same event and socialise, which is working a treat. It's also a good opportunity for us to show off the club and the range of levels of competitors, so great to see all of those SWA vests out in action at these local events. Copyright © Southport Waterloo Athletic Club 2018. All rights reserved. 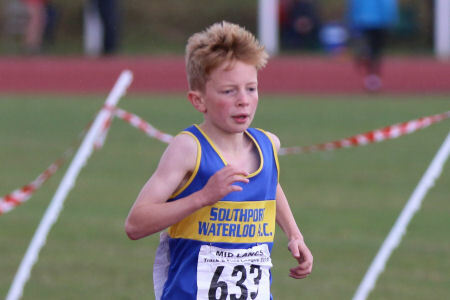 Southport Waterloo AC is affiliated to England Athletics .